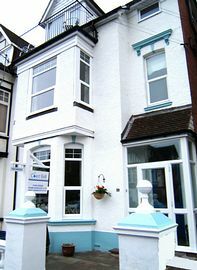 We are a very short stroll from the sea front, the old town, town centre and De La Warr pavilion. 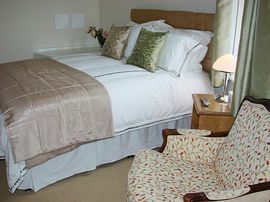 Our rooms are stylish and individual, whilst retaining many period features. 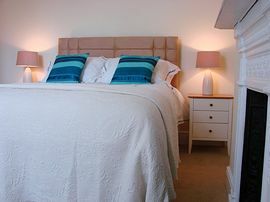 All are contemporary, en-suite with bath/shower, or shower. Plush white towels, sumptuous quilts, and a well stocked hospitality tray, flat screen TV with free view, and free wi-fi access. A family room with luxurious super king and generous sofa bed has a very well appointed bathroom complete with shower cubicle and roll top bath and plenty of soft towels. for more information please see the link above or the contact details below. 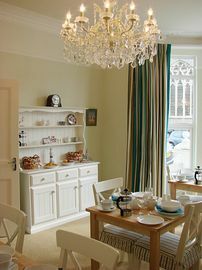 Rooms start from £35 per person per night (assuming two people sharing) and rise to £45 per person per night. Prices remain the same throughout the year. '...and with its airy but private rooms, minutes from the sea front and De la Warr (pavilion) it's a godsend for younger visitors' Bella Todd, Time Out London (May 6 - 12 edition). 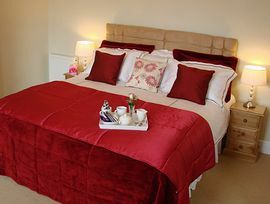 Wow, what a beautiful place to stay, I've just come back from visiting friends over Christmas, wish I had booked for longer! Bexhill-on-Sea is located between Hastings in the east and Pevensey/Eastbourne in the west. Bexhill is only 60 miles (100km) from London and the main route in is the A21, which is linked to the M25. It can also be approached from the west via the A23, A27 and A259 for the Channel crossings. Free, nearby off street parking by arrangement. By Train Frequent trains run from London Victoria (or Charing Cross via St Leonards), and the journey takes approximately 120 minutes. The coastal service runs the length of the South Coast and Bexhill is well served by the hourly service from Ashford. Frequent trains run between Brighton and Bexhill and direct trains run from Bexhill to Gatwick. By Coach National Express operates regular daily services to Bexhill from Victoria Coach Station, with connections to most cities in the UK. The ports of Dover (45 miles), Folkestone (38 miles), Newhaven (31 miles) and Ramsgate (50 miles) are close and there are day excursions by coach from Bexhill to France, Holland and Belgium. The international London Gatwick Airport handles direct flights from all parts of the world, with internal flights operating from the rest of Britain. Gatwick is on the Victoria line, offering a direct link with Bexhill and is less than 50 miles by road. For car drivers "Le Shuttle" connects the South East of England and Northern Europe from Folkestone. Alternatively, take the "Eurostar" Passenger Train to Ashford International and change at Hastings for frequent connections to Bexhill.